Waltheri's go pattern search - about the web application. 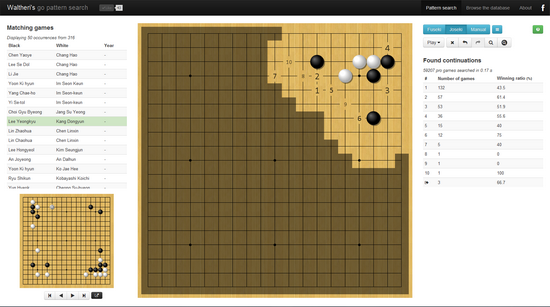 Waltheri's go pattern search is a web application for searching go positions such as joseki and fuseki in professional go games. It is very useful for studying - if you aren't sure how some joseki is played, just create a position on the board and you will find all occurrences of given position in pro games with continuations which have been played. Waltheri's go pattern search uses extensive database of professional game records. Actually it contains almost 70 000 kifu with latest games. Due to better performance it is possible that database won't be fully searched, but all results all cached, so repeated search can gain new results. Working with pattern search is very easy and intuitive. There are 3 modes for selecting positions. Fuseki - full board search - you just click on board. Joseki - the searching is progressing only on area around stones, you can freely setup the position. Manual - you can freely select searching area and setup position. By searching buttons you can find possible continuations in different colors.